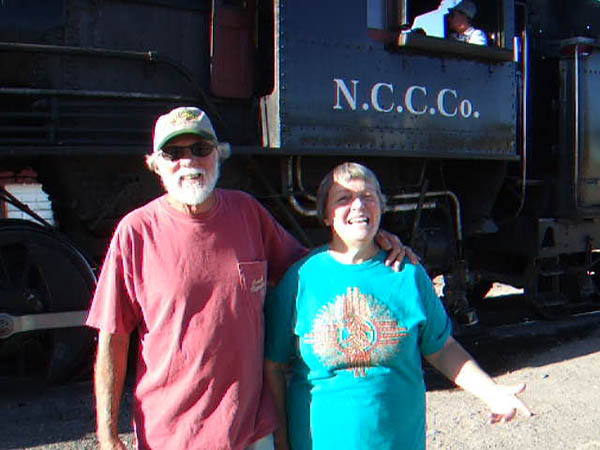 WHAT: You will be in control of one of the original Nevada Northern Railway locomotives, running it on the original mainline. WHO: You can share the experience with another person. Both of you will be in the cab and take turns controlling the locomotive. BRING: Work gloves, boots or sturdy shoes, long sleeve shirt. and pants made from 100% cotton or wool. Sign on as a Nevada Northern Railway engineer for your own trip "Up the hill" through Robinson Canyon, up toward the old Ruth Mining District. 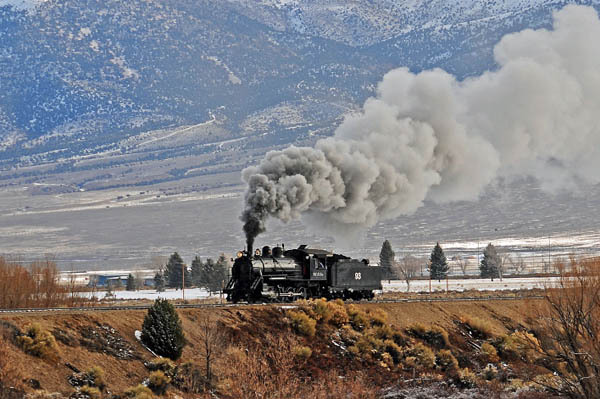 You (and a friend, if you like) will climb on board and experience what railroading was like in the last century - at the throttle of one of the original Nevada Northern STEAM locomotives. Diesel experiences are also available. Click here for details. Begin your engineer experience by studying the safety training materials that our regular and volunteer crews learn from (download here). There will be a test on the basics, but we are there to help you all the way through. 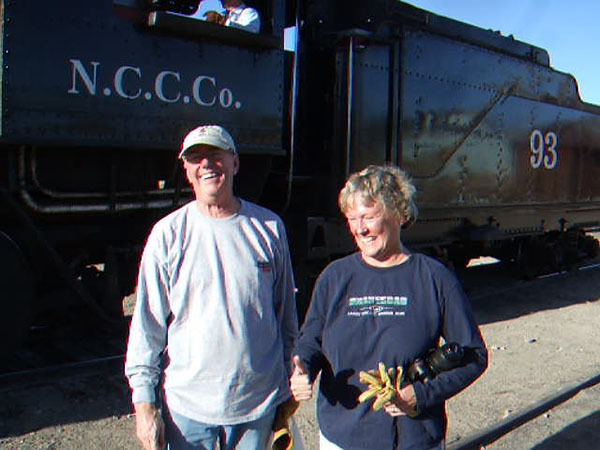 It is then time to head down to the century-old Enginehouse and help prepare your locomotive for the day. 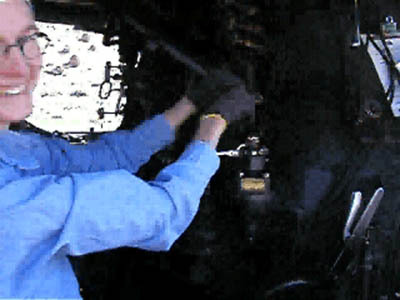 Climb into the cab, and learn how to operate the iron horse. 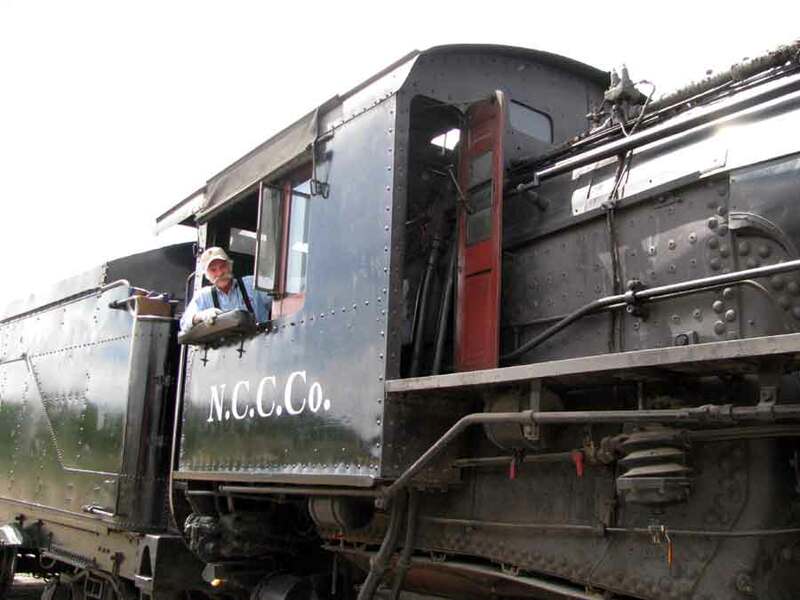 Your mentor engineer will show you the ropes as we move the locomotive out of the engine house, through the yard, and onto the original NNRY mainline. It's then your turn! Climb up into the engineer's seat and receive personal instructions from your mentor engineer on controlling the throttle and brake. Once the basics are under your belt, the moment comes for you to sound the whistle, have your hand on the throttle, and head up the mainline toward the mines. You will be going through two tunnels and climb over 2.5% grades. Up toward the end of the line there is a wye. 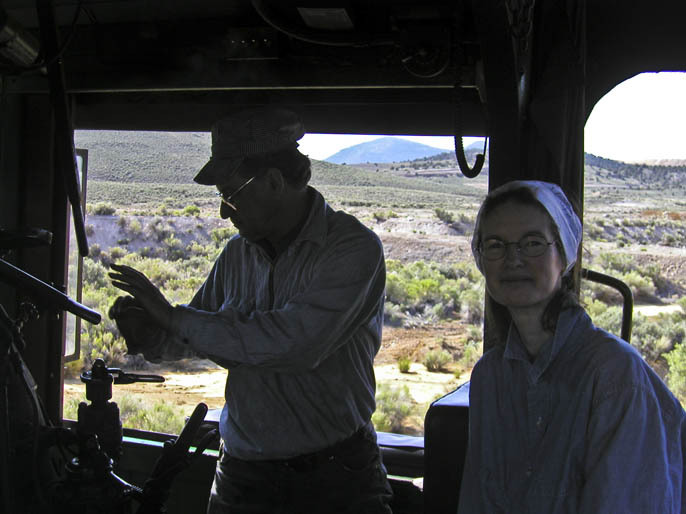 We will turn the locomotive then head back down to Ely, gaining hands-on experience with controlling a locomotive on a mountain grade. 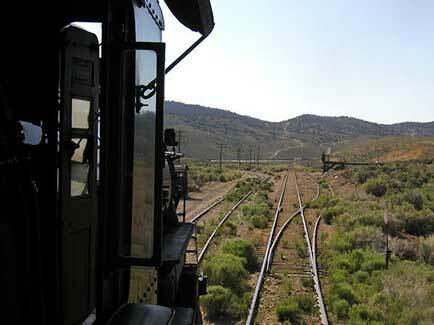 This is real standard-gauge main-line mountain railroading on America's best-preserved railroad. You are at the throttle. You are the engineer. You are running a steam locomotive. There are several options available. You can take control of one of the vintage steam locomotives, or one of the vintage diesel locomotives, or operate both. Most people come and take the locomotive out without a train attached. It is an easier way to start, and requires less training. Taking the locomotive out with a complete train adds the additional skill of controlling a train on our mountain grades. You may find that it is easier to get the train up a grade than to bring it safely back down. 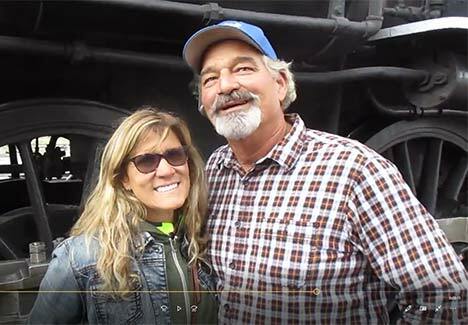 Early in your trip you will begin to appreciate the genius of the Westinghouse Air Brake system, its complexities and limitations for mountain grades - especially on steam locomotives since they do not have dynamic brakes. You will also learn the "technical" term for using up all of your braking capacity by applying and releasing your train brakes too often coming down the mountain grade. So what are you waiting for? 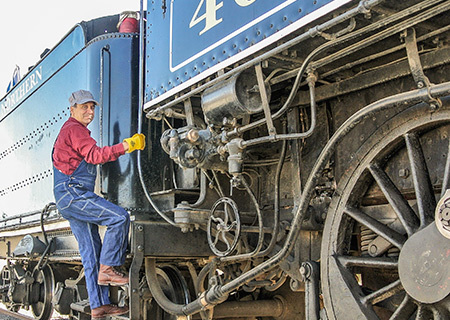 You can have a hands-on experience with railroading in the last century. Make your appointment with history. Use the calendar below to pick your date, or call and book your locomotive rental or train rental today at 1-866-40STEAM (1-866-407-8326). You can operate a steam engine! You can drive a steam locomotive! P.S. What would be a greater holiday, birthday, or special gift than being at the throttle of one of our engines for a real engineer experience? You can buy an "open ticket" as a gift and select the exact date later. Locomotive Rental Frequently Asked Questions. NOTE: Participants must be able to climb up to the cab unassisted. Due to the harsh environment in locomotive cabs, no medical devices or assistance, such as oxygen, is possible. Requires sturdy closed-toed shoes, gloves, a long sleeve shirt and pants, all made from all-natural material (cotton, wool, leather - no synthetics, vinyl, or rubber except boot soles). You must be over 18 years old and have a valid driver's license to operate the locomotive. One rider, 12 years or older, may ride along in the cab at no additional cost. (standing room only for rider). Engine availability is subject to a variety of both controlled and uncontrolled circumstances. 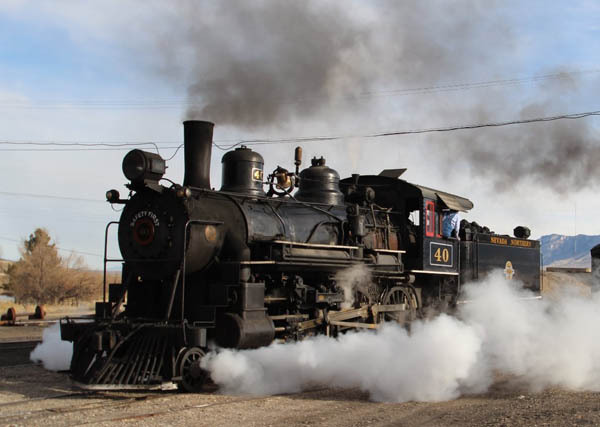 Both steam locomotives are over a century old and even the "new" diesels are a half-century old. It is very rare, but possible, that circumstances may require delays, substitutions, or rescheduling. Prices below are for the Engineer Experience. That can be one person, or two people sharing the experience. These prices represent our best estimate for the long-term sustainability of the locomotives, right-of-way, and maintenance facilities. We are an independent non-profit foundation that relies on your continued patronage to sustain the programs here. A portion of the program cost may be tax deductible. Hover over the prices below to determine the amount that you can speak to your tax advisor about. We will provide a receipt when you purchase an event. Members receive discounts. Memberships start at only $30. No other discounts apply to this experience. If you're ready to book your Be The Engineer - STEAM experience then hover any available date below to book!